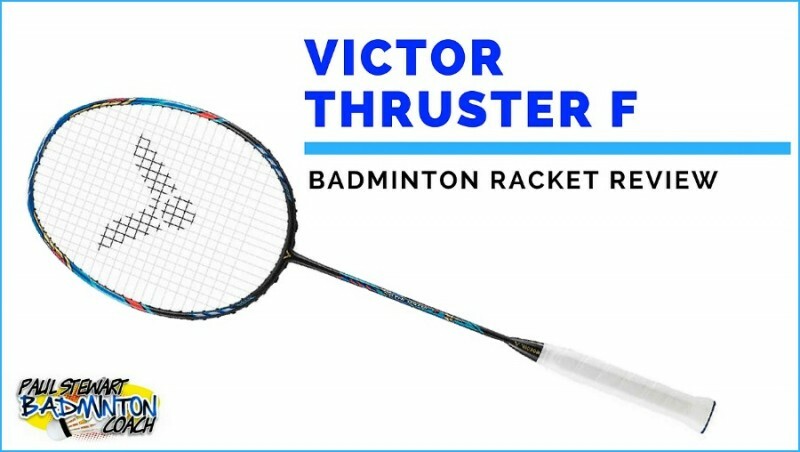 Introduced into the Asian market in 2017 and Europe in 2018, the Victor Thruster F (TKF as it becoming known) has caused a stir with it’s slightly elongated shape. 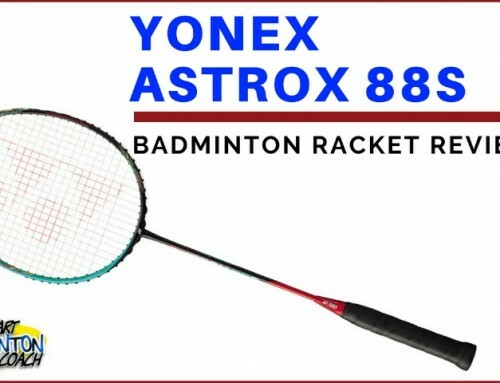 This racket is set to replace Thruster 9900 as the pinnacle of the head heavy series from Victor, but will it catch on? 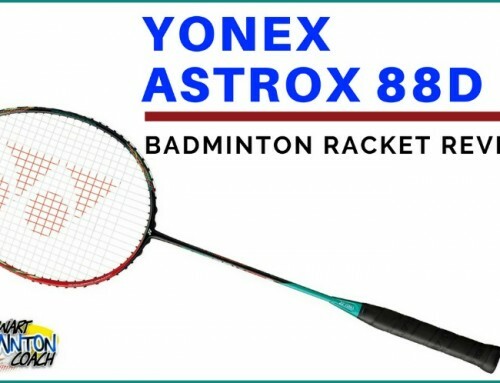 Is it one of those rackets that will captivate the head heavy users amongst us and deliver a powerful, controlled hit and yet still provide a level of manoeuvrability in defence? 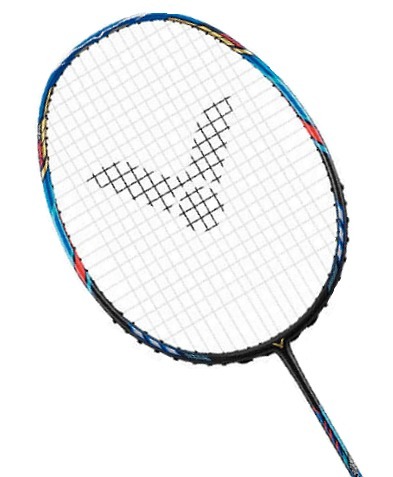 TKF is a really attractive racket featuring a matt black finish, vibrant decals in two shades of blue, gold and red. My review sample is a 4U (80-84g) with a grip size G5, my favourite size. The standard full length cover in black, white and red is included. Quick thought here. I wish Victor would widen the full length at the handle end as it’s a tight fit. The frame required stringing and I selected a .068 gauge string for the review at my preferred tension for reviews of 25lbs. For those that have read previous racket reviews or Facebook posts, you will know that I test a racket over a period of 2-3 weeks. 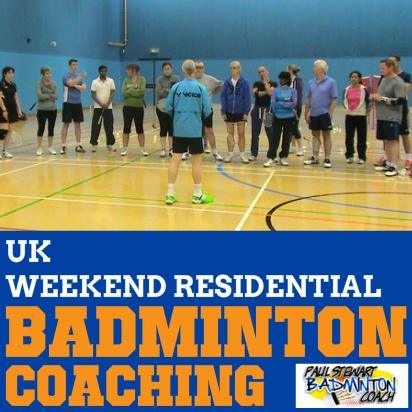 The racket will be used in various coaching and/or demo sessions in addition to testing sessions which are booked for one hour. This provides me with a better overall feel for the racket. I have seen other demo tests undertaken in less than five minutes and I believe this does not provide time to thoroughly test and feel a racket. 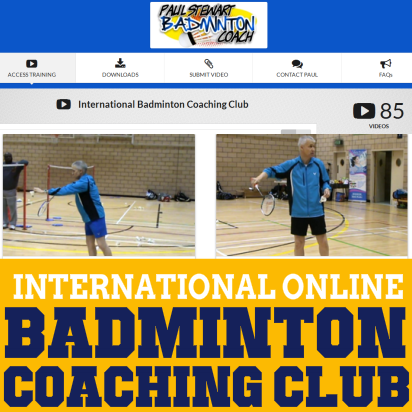 I have the time to acclimatise to a racket as some can be difficult to get used to and therefore provide a more experienced review. Initially I didn’t like the Victor Thruster F. I expected a heavier head and for some reason I wasn’t that attracted to the feel. However, this is why I test over a period of time. I wasn’t hitting poorly and my shots were sailing clean to the rear court, but I simply didn’t like the feel of the racket. Maybe it was the slightly elongated head shape that was causing the problem? Perhaps I was expecting a slower swing? I wondered whether this was really a head heavy racket because it didn’t feel it. Jetspeed 12 felt heavier which was a surprise. However, it soon became clear that the weight is situated towards the T piece, hence the good head speed. I recall commenting on Arcsaber 900 Technique that it had a unique feel and TKF shares this attribute. I suspect it is because the head weight has been shifted and that is why it took longer to feel this racket. It’s worth noting if you decide to test it. The head heavy, stiff shafted TKF swings fast without so much as a hint of lag. It is powerful and yet quick in the swing which allows those snappy wrist styles a chance to add this to their test list. There were no incidents of framing the shot which I half expected because of the slightly varied head shape, although once or twice I caught the shuttle close to the top of the frame, thankfully without string breakage. Overall, once dialled in, I was really happy with the power this racket generates. Drop shots were good once I had got the timing right on the racket. I actually preferred the combination of racket head speed combined with head weight over a frame where the weight is at the top. My shots were solid and allowed plenty of variation without the racket feeling unwieldy. Slice shots felt easy, like cutting through utter with a hot knife. 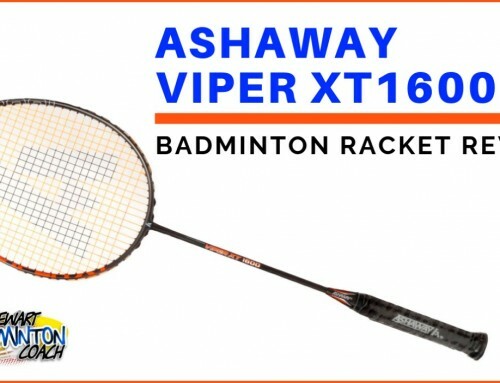 I’m really pleased I selected Ashaway Zymax Fire 68TX with this racket as the combination of frame and string work so well, especially when requiring heavy slice. Smash was good with TKF. It doesn’t quite hit as hard as other rackets but the added benefit is that it’s not as tiring on the arm. Mark was still unable to unleash a few thunderbolts and I hit a few too which was even more of a surprise. I think I’m beginning to like this racket a lot! Flat drives were really easy, with the TKF feeling more like an even balance racket. There was power, control and no signs of fatigue; that’s an ideal combination. Once again this racket held a few surprises because it defends really well. Of course, I don’t expect it to perform at the heights of a Jetspeed 10 in terms of speed, but, for my age, I have fast hands and very few smashes pierced my defence. I also liked the feel on the stringbed, providing that solid base for close to the net blocks or drives. By now you’re probably thinking I’m rather smitten with Victor Thruster F, and you’d be right. 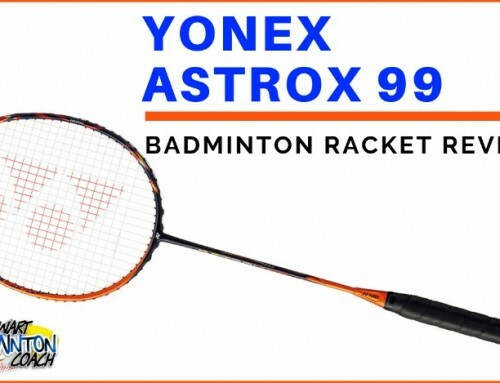 I’ve allowed other players to use it and so far, 93% have preferred it to their existing rackets. 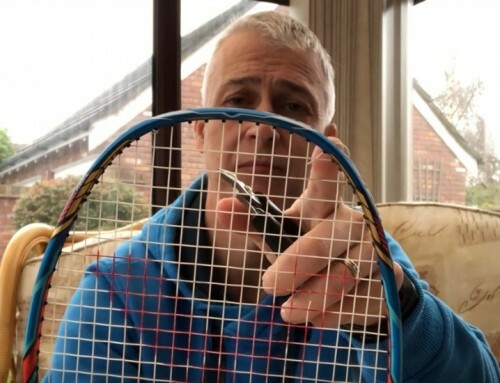 Is it the perfect racket? No, there’s no such thing, but it got me thinking how head heavy users tend to prefer the weight at the top of the head whereby I’m beginning to question whether my preference is with the weight slightly lower to get the best of both worlds. Maybe this explains why I was so attracted to Arcsaber 900 T at the time. This is a very powerful racket but I suspect some players will not like the head shape. 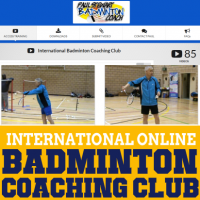 Others may not give the racket time and switch too early which is a shame, but these days we require instant results, and most of the time, this is without putting in the work. This racket falls within the head heavy bracket although some may say it’s closer to even balance. Whilst I disagree with this opinion, it simply reflects the fact that we all feel a racket different to others. We have a unique way of feeling a racket, as individual as our fingerprint. There isn’t a racket that suits all and I’m delighted this is the case. TKF will find it’s market, but there’s no doubt it is a quality racket. RRP on TKF is a hefty £200 but retailers are already discounting to around £160. 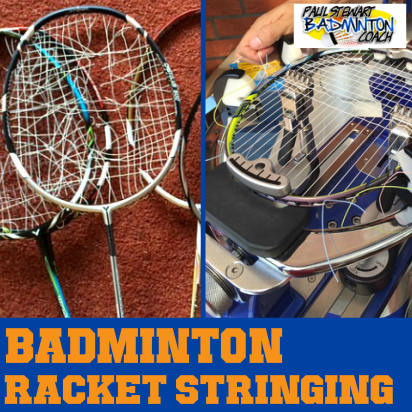 It’s a lot of money to spend on one racket, despite it being extremely good. Since arriving in Europe in March, and with little advertising, TKF has sold out twice already. That’s a great achievement and I can understand why, irrespective of player endorsement. I have deliberated for some time over my rating for Thruster F. Whilst I love TKF, and it is my racket of choice this year, it’s important to weigh up the pros and cons and value for money. In this respect, setting my own preferences aside, I rate the Victor Thruster F 4.5 stars and highly recommend you give it a test drive with the caveat that you may need to test for a little longer than usual to allow for the new shape and weight placement. In your opinion what is the best Thruster and why? TK 9900 or TKF? You said about the TK9900 ” I felt as though I could hit all day with Thruster K 9900, and that’s a huge compliment for this type of frame.” It´s possible said the same about the TKF?